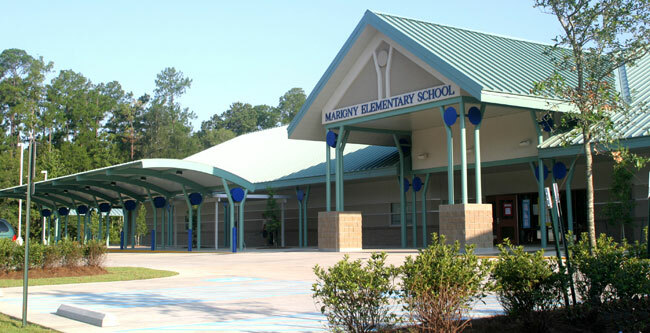 Marigny Elementary opened its doors August 2009 in Mandeville, LA. The school is named after Bernard de Marigny the founder of Mandeville. Marigny Elementary is a Pre-K through first grade school with appoximately 500 students. The starfish is our mascot and our school colors are light blue and red. Marigny Elementary is a place where we make a difference. If you have any questions please contact us at (985)674-3011. -Our school uniform consists of any light blue Marigny or plain T-shirt or sweatshirt, light blue polo style Marigny shirt or shirt with no emblem, light blueturtleneck shirt, khaki pants, capris, shorts, skorts, jumpers, or skirts. -Students are asked to wear closed toe shoes such as tennis shoes, topsiders, or oxfords for comfort and safety. - Please remember that our young students are still learning how to manage their bathroom needs so clothing should be child friendly and encourage the student's independent skills. -Red starfish spirit shirts may be purchased throguh the school and can be worn each Friday only. -Special First Grade Starfish Shirts may be purchased throguh the school in February. First grade students may wear these shirts any day to school beginning in March of each school year. -Sandals, backless shoes, Crocs, cowboy boots or flip-flops are not part of the uniform. -Outerwear and raincoats with hoods are suggested in cool and/or inclement weather. -Elaborate jewelry is discouraged. Please leave hats, combs, brushes, sunglasses, and purses at home. -Please label all of your child's clothing and lunch boxes with your child's name clearly marked. -School board policy dictates that boys' hair may not exceed should length, including rat tails. -Do not send toys, jewelry, or other expensive items that may be lost or damaged. The old man awoke just before sunrise, as he often did, to walk by the ocean's edge and greet the new day. As he moved through the morning dawn, he focused on a faint, far away motion. He saw a youth, bending and reaching and flailing arms, dancing on the beach, no doubt in celebration of the perfect day soon to begin. As he approached, he realized that the youth was not dancing to the bay, but rather bending to sift through the debris left by the night's tide, stopping now and then to pick up starfish and then standing, to heave it back into the sea. He asked the youth the purpose of the effort. "The tide has washed the starfish onto the beach and they cannot return to the sea by themselves," the youth replied. "When the sun rises, they will die, unless I throw them back into the sea." As the youth explained, the old man surveyed the vast expanse of beach, stretching in both directions beyond eyesight. Starfish littered the shore in numbers beyond calculation. The hopelessness of the youth's plan became clear and the old man countered, "But there are more starfish on this beach than you can ever save before the sun is up. Surely you cannot expect to make a difference." "I made a difference to that one."